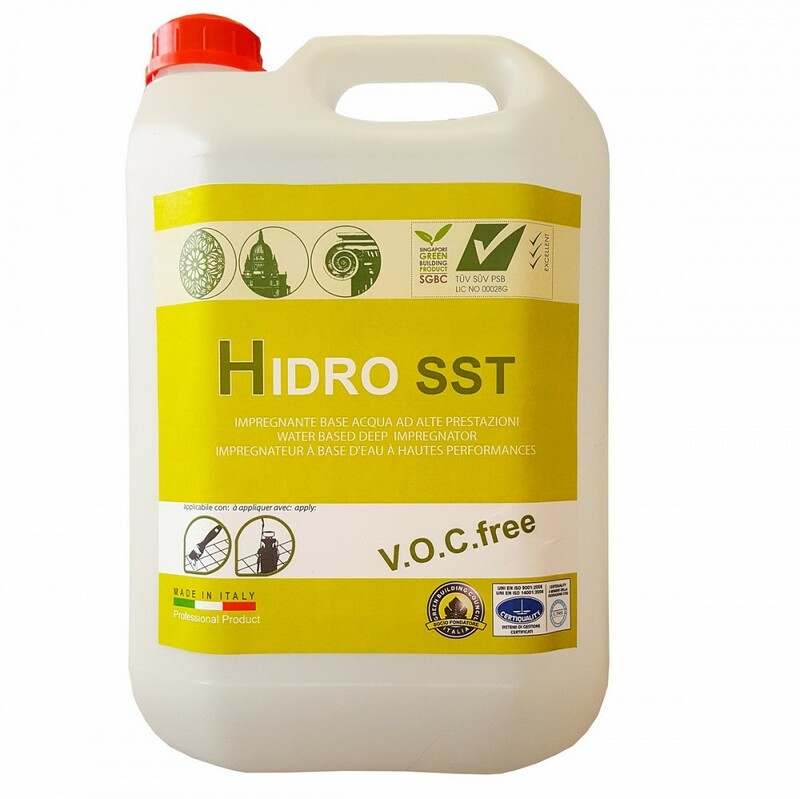 HIDRO SST is a top-quality impregnating treatment to protect natural stone against the harmful effects of water and rising damp. It is characterised by a 100% water-based, eco-friendly formula and for its lack of volatile organic compounds (V.O.C. Free), therefore, its use is not harmful to the environment or for the health of users, either during or after application. The specific characteristic of HIDRO SST is that of penetrating natural stone deep down, guaranteeing strong, lasting protection without compromising the original breathability of the surface, since it does not create any type of film. It also does not alter the original appearance of the material. HIDRO SST is a product that combines water-repellent properties with a good resistance to rising damp, which is responsible for the majority of problems generally found on natural stone: persistent damp marks, formation of rust, yellow damp marks, flaking or detached surfaces (pitting), salt efflorescence and surface aggressions. Unlike traditional water-repellent and damp-proofing treatments available, HIDRO SST helps to increase the resistance of the natural material to dirt and foot traffic, working as a definitive solution due to its high resistance to the action of de-waxers. HIDRO SST is also certified for contact with foods and therefore, is a valid solution for protecting kitchen worktops. – it is used as a 6-side, pre-treatment to prevent rising damp, leaving a high degree of protection without compromising adherence between the underside of the material and the bonding agent used, even in the event that stone can be installed with simple cement mortar or mechanical securing. – it is used as a 5-side, pre-treatment (top+edge) in the event that stone can be installed with top-quality mortar or mechanical fastening. – it is used as a subgrade pre-treatment (back treatment) together with a 5-side, pre-treatment (top+edge) in the event that stone can be installed with a bonding agent that cannot be used with a 6-side treatment carried out using the same product. HIDRO SST is an extremely valid water-proofing solution for natural stone that has already been laid. In this case, however, the protection against rising damp will depend on the moisture already present inside the material, which will have already been subject to moisture during the laying process. To get the best possible performance, including with regard to protection against rising damp, it is therefore necessary for the surface to be free from older damp stains and it is also important to make sure that the surface being treated is as dry as possible; this is to allow the product to penetrate correctly. In any case, it is always preferable to pre-treat natural stone. On material that is particularly difficult to protect, HIDRO SST is also extremely effective when used as a protective primer before applying a stain-proofing product to the surface. HIDRO SST boosts the stain-proofing action of a protective coating, increasing its durability and resistance to foot traffic.